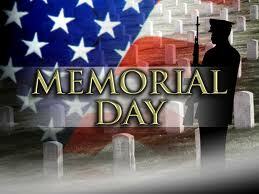 Today we celebrate Memorial Day, which is widely known as the official start of summer. It is celebrated with friends and family, at the beach, in the back yard cooking out, or just enjoying the long weekend. But let’s not forget the true meaning and purpose of the day. Every time I am traveling through airports, I see our young men and women in the armed forces leaving or coming home and always think about their service to our country. I also think about the first responders who ran toward the explosions in the Boston Marathon bombing and 9/11, risking their lives for others — for all of us. These are stark reminders of the dangerous world we live in and how fragile our freedoms and life really are. Yet, these men and women put themselves in harm’s way so that we can enjoy the freedoms of our great nation. That is what today is truly about — remembering that ultimate devotion and sacrifice that these soldiers, sailors, marines, guardsman, police, firefighters, and EMS personnel all do for us. Please take a moment to join me in remembering our heroes, both living and fallen, today at 3 p.m. in a moment of silence.